Meesapulimala is one of the most visited places in Kerala welcoming honeymooners, bikers, mountaineers and adventurists alike. Credited to be the second highest peak in the Western Ghats, Meesapulimalastands elevated at an altitude of 8660 feet above sea level. 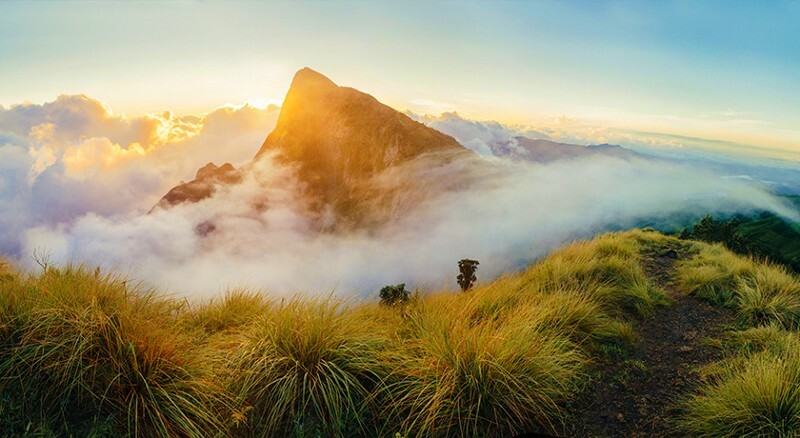 This breath-taking peak is tucked away between the Anamalai Hills, and is around 20km away from Munnar. Meesapulimala Peak resembles much to shape of a moustache and is, therefore, called Meesapulimala. Meesapulimala is an ideal place for treckking and one can start journey from either Rhodovalley or Silent Valley, which is 6 km prior to Rhodovalley. A trek to Meesapulimala is a rejuvenating experience for any travel lover. The panoramic view of the majestic range of Munnarand the sight of mountains engulfed by the swaying clouds is a bliss to watch from the top. The trek to the top is a scenic delight with herds of wild elephants and mountain goats all around. There are two Meesapulimala trek routes. One is through the red rhododendron forests of Rhodo Valley and the other is via the small village of Kurangini. Kerala Forest Development Corporation (KFDC) conducts trekking to Meesapulimala as part of ecotourism programme. If you wish to scale this majestic mountain this is the only way to go as the government has announced all other trekking to be illegal. Enthrall in an amazing trek to Meesapulimalai, Munnar with friends and family for a completely unraveling experience like never before. Mountain Trail Resort is built with a unique ethnic design that blends beautifully with the scenic surrounding of Munnar. The resort is nestled against the milieu of Western Ghats, offers a magnificent view of Sahya Mountain Ranges and the meritorious view of the misty valleys. It offers a memorable stay with unmatched hospitality. It is an ideal place for honeymoon couples because of its excellent location.